What are those branches doing on that lady's back? 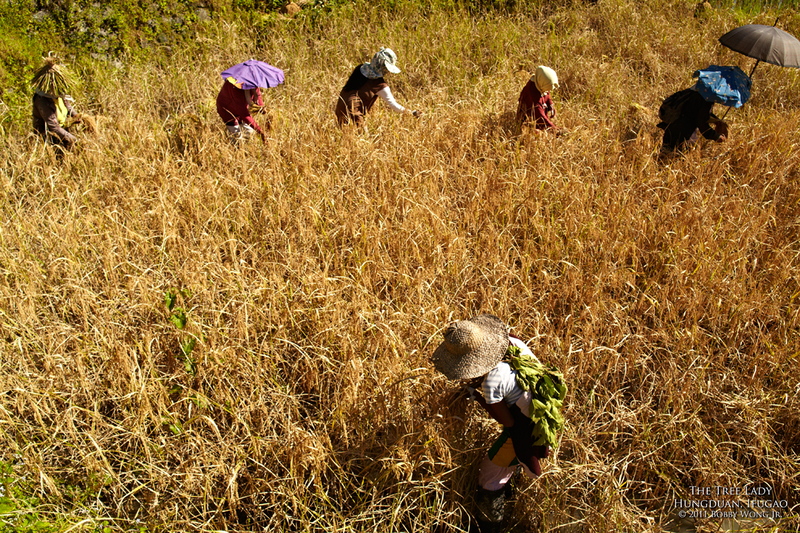 We've come to photograph harvest in the Hungduan Terraces in Ifugao. The folks here harvest their fields while still submerged in knee-deep water, so we couldn't step into the fields ourselves to take closer shots, all because of the love for dry socks. But from my vantage point I could see a broader view and that's when I noticed how resourceful these farmers really are. To protect them from the searing rays of the sun, some of them resorted to attaching branches to their backs. Good one. Others formed hats out of bundled reeds. And still others re-purposed umbrellas into headgear. You have to admit these mountain folks wouldn't be tilling this land for thousands of years if they couldn't adapt. So much for city slickers and their love for dry sock. Enjoy. Hipongor, Himbotok, & Himvoto... what do all these strange words mean? On the road once again, from Hungduan to Banaue in the province of Ifugao, we passed a farmer balancing bunches of newly harvested rice on a bamboo pole. He was obviously stunned by the sudden attention of six cameras, but ultimately grateful that he was able to sell a couple of bunches that lightened his load. 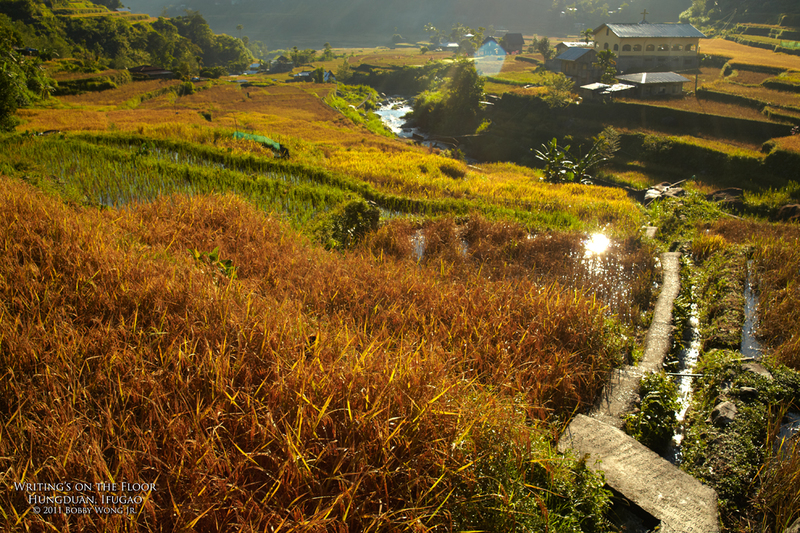 The small towns around Hungduan and Banaue aren't that far from each other. Many are only a day or two by foot. Yet their language has evolved quite a bit for a people living so close. 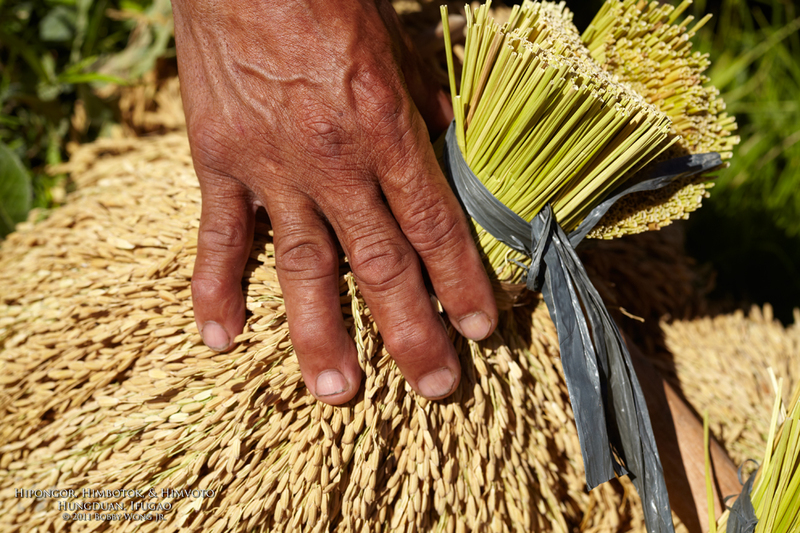 A bunch or bundle of rice is called either a hipongor, a himbotok, or a himvoto, depending on which town you lived. Similarly sounding but clearly different. Isn't it amazing how the evolution of language, and likely culture, can take place even among such nearby communities? Enjoy. There are few subjects more universally heart-touching than that of a mother nursing her new-born child. We were walking towards the town of Hapao in Hungduan when we chanced upon some makeshift homes by the side of the road. Some kids playing outside kept most of our cameras busy. But it was through an open window where we discovered the real deal. Inside one of the homes, a young mother is nursing her newly born child. 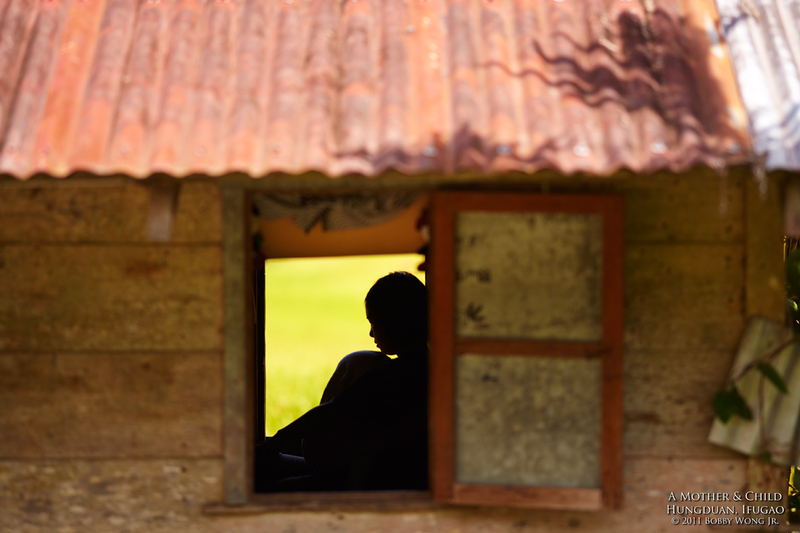 She sat in front of another open window at the rear of the shack, looking alternately at her child and then into the terraces beyond. I don't know what she was thinking of at that very moment, but you can fill in the blanks. Enjoy. Sometimes, it’s the shadows that make a photograph. 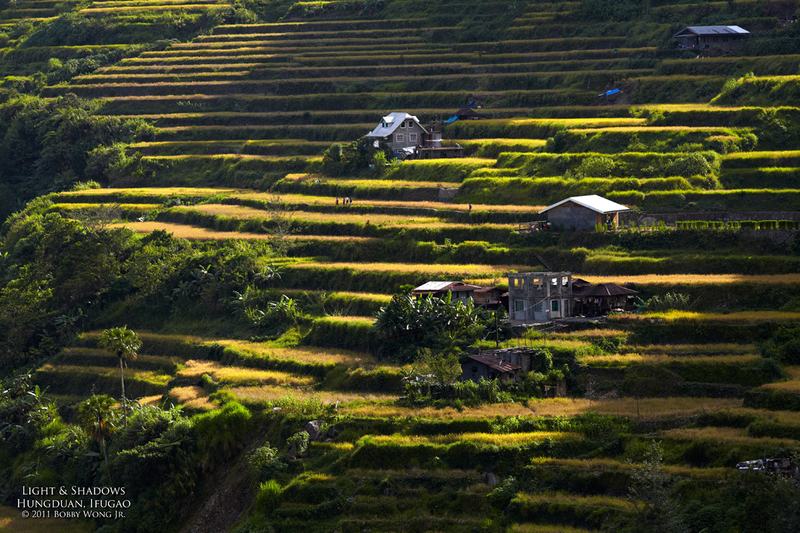 We were exploring the slopes of the Hungduan terraces in Ifugao amidst fast-changing late afternoon light. The sun was about to set and the light had become directional, casting shadows onto what was previously a brightly lit landscape. The terraces took on an ominous, almost dramatic, mood compared to just minutes ago. I like to photograph at these moments because grand landscapes become dramatic landscapes. The random patterns of light and shadow adds character and imbues mood. We don’t often see a landscape lit this way, but that’s how you make unique photographs, by taking them under lighting conditions that can last only moments. Now you know. Enjoy.